While digging the ditch, workers could carve into the top outside edge all around the perimeter a shelf deep enough for a man to stand upright. A short step would also be shaped to enable that man to make himself high enough to peek over the edge and, if a musketeer, take a shot or two at prowling enemy. The protected shelf with little step inside was the covered way. Completely surrounding the ditch, the covered way enabled outside defenders to reposition themselves to one side or the other in response to enemy pressure. 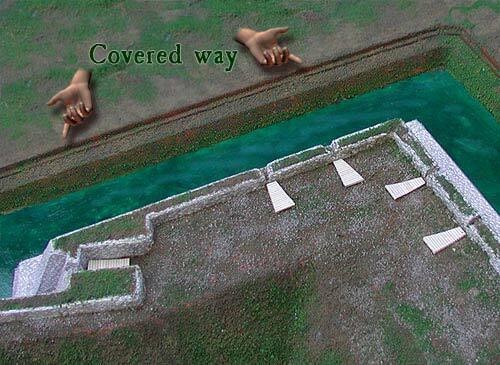 The covered way was so vital to the overall defense of the artillery fort that a common saying in some 17th century armies was: "Covered way lost, everything lost!" Another way to judge the importance of this feature and how it was employed was its synonym: "covert way." The concept of the covered way was originated in 1556 by an artillery expert, Niccolo Tartaglia, as a place for stationing some infantry before the walls. This worked so well that in construction of later forts the covered way was widened in order to hold more troops. They became as wide as six to seven meters. The covered way and glacis in relation to the ditch/moat and fort. Click here to see a closer profile for these beyond-the-ditch features, and double click to return. Sloping at a slight angle out from the covered way was the glacis (a name suitable for a sweet confection). This featureless plain offered an exposed field to be swept by defensive fire. More important, it raised the ground in front of the fort's walls to protect the base from enemy artillery. The glacis "lowered" the profile of the fort itself, rendering it less exposed. At the outside perimeter of the covered way or atop the bastions or around the sconces - or alongside the trench being dug by besiegers toward the fort - temporary and portable defenses could be thrown up. Set up in rows and along lines, these devices provided protection stronger than their outward appearance would suggest. They were gabions, fascines and (yes) bales of wool.